I WON!!!!! I won on Fridica's blog giveaway. Too funny!!! She won my last giveaway!!! I really, really, really want to win this giveaway. 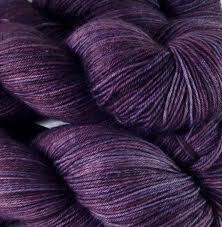 I have yet to buy any Yarn Love, but drool over it all the time. I just sent Hubs the link for pressie buying....I probably won't win, as I have won from her before, but man do I want to! Don't those bottom ones kinda look like the aliens from that movie? I know a bunch of babies that have been born in the past year (working in a school, kinda happens a lot) Anyway, the two latest is a yet unborn baby boy. The shower is on Thursday. Here is the sweater I made for him. The next sweater is for little Lillian, who is about 3 weeks old. I made a little chullo to go with the sweater. It is hard to see, but the little buttons on top are fish. I made her brother a sweater two years ago. 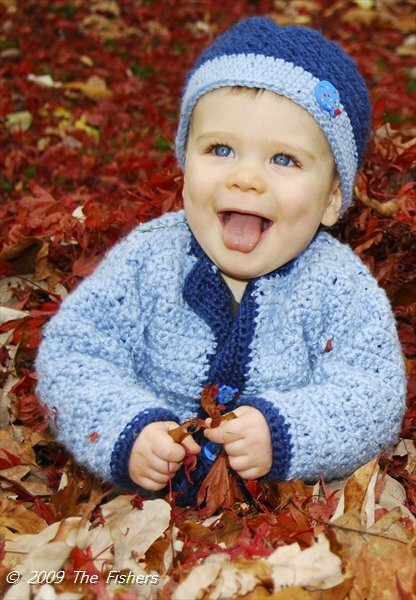 It is a version of the first sweater, without a hood. It also has fish, because their last name is Fisher. The mom wanted a fish, so I made him a stuffed fish and then the sweater with fish buttons. I refuse to do the Christmas thing before Thanksgiving. Poor Thanksgiving, it is so overlooked in the rush to shop for Christmas. He is hanging on our back door that leads into the kitchen. I bought a new curtain for it today, cleaned the windows and hung up Santa. Some years, he has adorned the top of the tree. I bought him in Maine many, many, many years ago and is made primarily of wood products. I also cleaned the front door windows, hung another new curtain and put up the tin Santa star my sister got me a couple years ago. It'll hang there until we get our wreath. My MIL used to make the wreaths, but has not been able to for a couple of years. Oh and I saw this for sale at Joanne's today...so guess I don't need any expensive ornaments.. The Hubs cooked....we had pork roast with roasted potatoes, stuffing, carrots, biscuits and apple pie. (I bought the pie from a fundraiser at school from a local farm). I crocheted. I know of a ton of babies being born or have been born in the past couple of months. These are the two sweaters I started yesterday. The blue one is for a baby shower at work on Wednesday. She knows I'm making her a sweater, but not about the shower. I asked for color choices. It's one of my favorite patterns and is easy to make. The pattern is here. I've made this sweater about 4 or 5 times. The last time I made it, it was way too skinny and I am waiting on the yarn to remake it. The other is a "Baby, It's Cold Outside" sweater. I have also made this one before. I am making it in a very thick yarn, so it may be more like a coat. The Mom for this one, stops by the blog sometimes. But since she just had the baby, don't think she'll be by soon and I'll give the sweater to her husband this week. So I've heard about Goodreads and decided that it would be a good idea for me. I love books, probably more than yarn. Really the title of my blog should be "Books and Yarn." There are certain genre of books I don't read, but for the most part, I'll try anything. I have a wide range of taste. In the new year I would like to read more classics and I've been trying to read more science fiction. I adored scifi books as a kid, but stopped reading them as an adult. Although scifi tv and movies are still my favorite. I'm gonna have a bookshelf search later for a scifi book I haven't read in years and want to revisit. The Hubs and I both have LOTS of books. I also have lots of books for school, both professional and children's books. I did not post about my visit to three other LYS' this summer. The first is InDetail Studio. I didn't actually have this one on my list. I was heading out to Granby and out of the corner of my eye saw a big YARN sign. So I turned around and went in. Well it is a Yarn and Bead store! How could you go wrong? Then I headed out to Marji's Yarncrafts. The owner was on vacation, but the ladies working were very nice. Not quite as knowledgeable, but very friendly. I lost the pictures I took here too. This store is a bit of haul for me, but I might go again. The last, which I recently visited was Black Sheep Yarns in Kent, CT. Kent was listed in Yankee Magazine as the best "leaf-peeping" area. So I headed over there the weekend before Rhinebeck. It was a little difficult to find, as it is off the main road toward the back of a plaza. There were many empty store fronts or closed store fronts. It was an adorable shop. Plus she stocks my favorite independent soap maker! Although I did not buy any yarn, I did purchase some needles, some felting materials and a few other things. I was saving my yarn budget for Rhinebeck. I will go back and visit her again, plus it's in a gorgeous area of the state. On my recent visit to Providence, Rhode Island, I stopped in at Fresh Purls. I don't know about you all, but anytime I am traveling, I look for a local yarn shop. Traffic in Providence is absolutely NUTS, but I was able to find the shop, thanks to Stella, my trusty GPS. Parking is a little tricky, because it's on a small, busy street. I parked on a side street and walked back. It was very bright and welcoming. The person working (and I'm sorry, I forgot to ask her name) was very nice and helpful. It got pretty busy while I was there. There were two other customers when I walked in and another two came in before I left. Another worker came in while I was still there. They were both very friendly. It is a long, narrow shop, but it wasn't hard to maneuver. I ended up buying three skeins of yarn. Two from independent dyers. I really like when I see LYS' carry independents. However, one I realized does not have a yardage listed. I hope it will be enough for the fingerless gloves I want to make with it. I'm not sure how "crochet-friendly" it is. They did have the Interweave Crochet magazine and the new accessories issue, that I have been looking for. Also for one of the skeins of yarn, the person working asked me to send a picture of the yarn worked up in crochet. They had a hat done in knit and she said she'd like to see how it works up in crochet. However, the only crochet hooks I saw were a set of Susan Bates. I'm always on the lookout for new hooks to try. So lack of supplies is one thing, but there did seem to be a genuine interest in crochet. I did not look at their books to see if they had any crochet titles. I definitely would visit again, if I'm in the area. is a very proud Irish Momma. Her daughter, Caitlin, has qualified for her tenth year at World's!!!!!!! I've gone to several of the dance competitions over the years. I even went with them to San Diego to Nationals a few years ago. This is the first time I went to the Oireachtas. It was held in Providence, Rhode Island. Caitlin looked fantastic and danced really well. She placed fifth and will be making her tenth appearance at the World's! Go Caity!!!!!!! The back of the dress.. I have been remiss in blogging this week. I need to acknowledge my cool packet of German yarn that arrived on Thursday. However I arrived home Thursday night after 24 parent teacher conferences and was exhausted. I slept 10.5 hours. I was not feeling well all week, so took Friday off. I have now been diagnosed with a sinus infection and double ear infection. I get them pretty often this time of the year, but I still feel miserable. I slept another 10 hours on Friday. I did go and see a dance competition that I'll share later in the week. But back to my box of German yarn. Blogging has become another social outlet for me. I do have a "real life" and real life friends, but I have met many great people through the "innernet." I have actually met many of them in RL, too. Through the Blog Hub on Ravelry, I have met several new internet/blogging friends. One such is the Gingerbread Lady. She mentioned wanting to dye yarn with Kool-Aid, but not having a ready supply. So I offered to send her some. In payment, I received a box of cool German yarn. Two Opals, one endorsed by a yodeling star in a skimpy outfit (I've seen some of this here) and a skein of Opal Surprise, which I've never seen here. I love the colors, especially in the Surprise. I also got two smaller green skeins, which are my colors. I can't wait to use them. I literally just finished the book, The Book Thief, by Markus Zusak. I don't know why it took me so long to read this book. It was engaging, the characters were memorable, the story was interesting. But for some reason, I would put it aside and finish other books. It was a remarkable story and one that will stay with me for awhile. I've always read stories set in WW2, especially having to do with the Holocaust. I have a bunch of YA literature set during that time. This year I have read several amazing stories set in that time period, but told from other perspectives, not a Jewish one. They have all been remarkable. Many, many months ago...could possibly be a year ago I bought some yarn from Three Irish Girls in the colorway "Aiden." It was for my friend, Deidre, who is very Irish and has a son named Aiden. And the yarn was green, her favorite color...It took quite awhile for the yarn to arrive and then I had to find the perfect pattern. I fell in love with a Drops pattern. I finished the scarf/shawl on Saturday on the way to NYC. I wasn't sure about it. You see, I ran put of yarn. So instead of coming to a point, the shawl ends in a straight edge that I created. It turned out to be four 16 year olds, but it was a great day. Really exhausting and I didn't get home until midnight, but a great day. We visited Ground Zero, and saw it from a side I had never been to before. We went to Winter Garden Shops near Battery Park...that is a gorgeous mall! Then we went to Canal Street. We didn't last long there, as my nephew wanted to leave. He thought it was too crowded, but then for the rest of the day he kept saying we should have stayed on Canal Street....duh! Walked around Times Square...We finished the evening waiting over an hour to be seated at The Hard Rock Cafe. Bootz (the nephew, his nickname, was upset when found out I called his sister my winggirl) really wanted to eat there, so we waited. We had gone to Dylan's Candy Bar before that, so they all had candy to much on. I stayed outside Dylan's, as I didn't need any more candy. I also stayed outside when they went into the giant Toys R'Us in Times Square. The family, Bootz (asleep on the way there), the winggirl and SIL (doesn't she look like her mom) and my brother. Ground Zero from inside the Winter Garden Shops, inside the Winter Garden shops, and one of the artistic displays with donated food for the homeless. Really cool! Getting my name done by a street vendor, self portrait on the subway, grabbing a slice. I am not a very serene person. And as I'm tied to the computer today, I can't travel far to find serenity. Now I love Serenity, the Joss Whedon movie, but how do I find serenity? Today I will be spending my day off tied to my computer entering grades. We are using the third new report card in as many years. It is all computerized and there are many kinks....I want to finish today, so I don't have to do any over the weekend, parent conferences start next week....ugh! Did a laundry basket fall out of a car? Did a woman throw out her cheating other's clothing? These are some of the questions surrounding the string of clothes going down the main road toward my school building. They go on for at least a couple of miles. Where did they come from? Did they blow off a clothesline somewhere? Why are they still there? Isn't someone missing their wardrobe? I can dream...I texted him back that I would like something in purple.... Let's see if he comes home with anything...I'll let you know....now I must devote myself to correcting papers...yuck! Today I went to the Inaugural New England Fiber Festival. This is my last festival of the season. The next festival is the Connecticut Sheep and Wool festival which takes place in April. Which is good, as I have spent at least a paycheck during the past 6 weeks and the three events I have attended. I'm thinking next year of going to some of the surrounding states festivals, too. It was a nice event, obviously smaller than Rhinebeck, but it will definitely grow. I had a good day. Here are some pictures.